If you want to see what can happen to that nice shiny outboard motor you just purchased for a small fortune, read on. These are just a few examples of what can happen in just a short time without proper care and feeding. Click on the pic to see the full size image. Use your browser's"Back" arrow or ALT/left arrow to return. 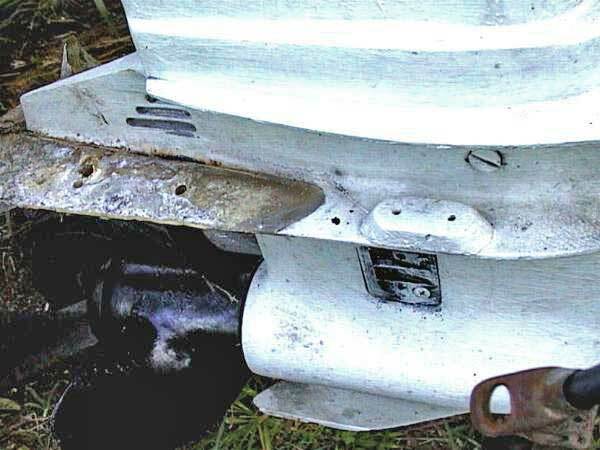 This is an example of the corrosion that can ravage any outboard built by any manufacturer in just a few short years of exposure to salt water and tropical conditions. 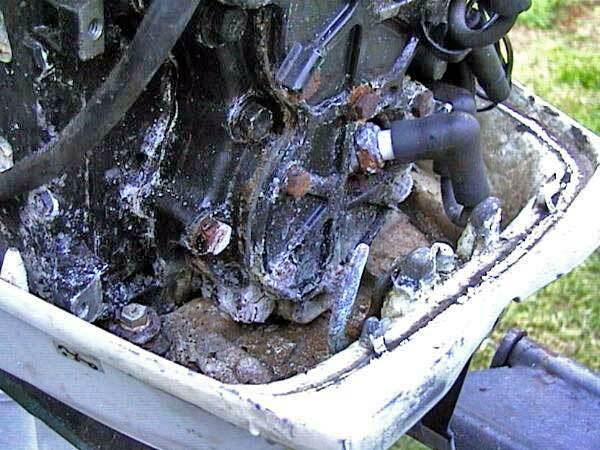 This motor is a 1994.
fresh water and an application of OMC 6 in 1 or your manufacturers' equivalent will alleviate this. This gearcase has been painted with some white finish, applied with a brush. In the process the zinc anode(on this model attached to the anti-ventilation plate toward the front) was covered with paint, rendering it useless for corrosion retardation. As a result, you can see the paint peeling away and corrosion towards the aft end of the plate where a trolling fin was attached. Terminated. You MUST USE good oil in your motor. 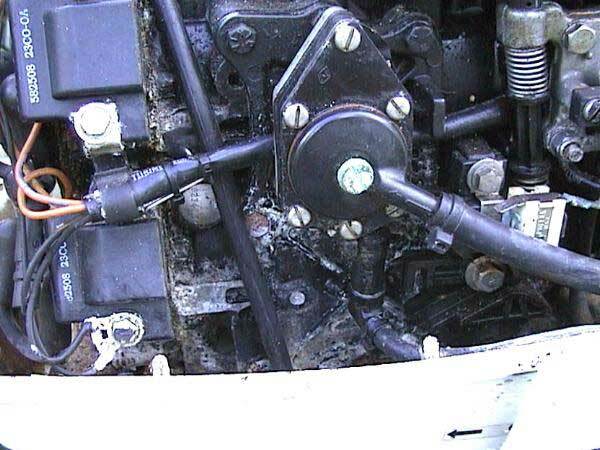 This con rod failure was caused by lack of proper lubrication. The roller bearings literally melted; the rod became so hot the cap bolt failed and the cap came off. You can see some of the thin sheets of metal that were rollers in the foreground. Damaged reed assembly from the engine with connecting rod failure. 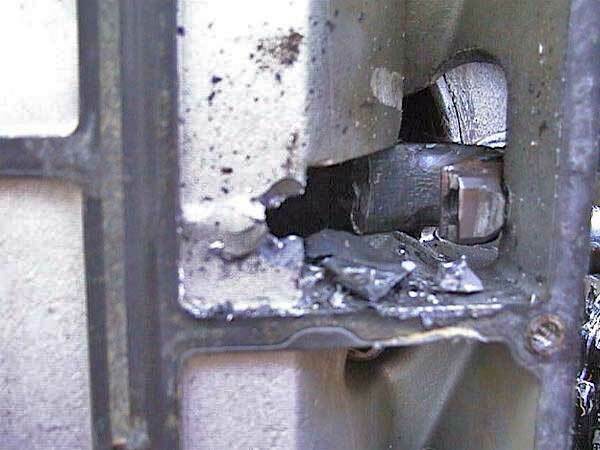 This motor was damaged beyond repair. This piston has an excessive buildup of carbon on the skirt. The lower ring is stuck in the land, the upper one will soon be pushed out of the groove and catch on the port, causing a ring failure. The rings are the medium by which heat is transferred from the piston to the cylinders, and with rings stuck, the problem is exacerbated by the heat. 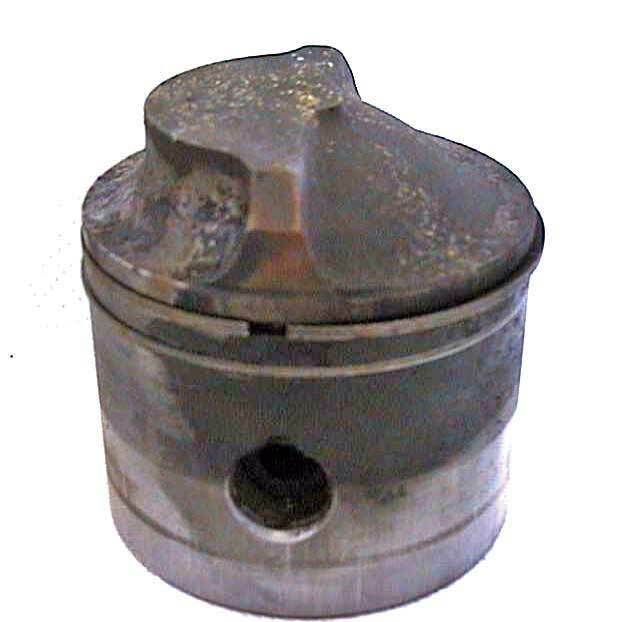 This piston came from a motor with less than 300 running hours. On older crossflow models it is IMPERATIVE you use TCWIII oil, PREMIUM gas, use motor manufacturers carbon guard additive and apply engine tuner seasonally. 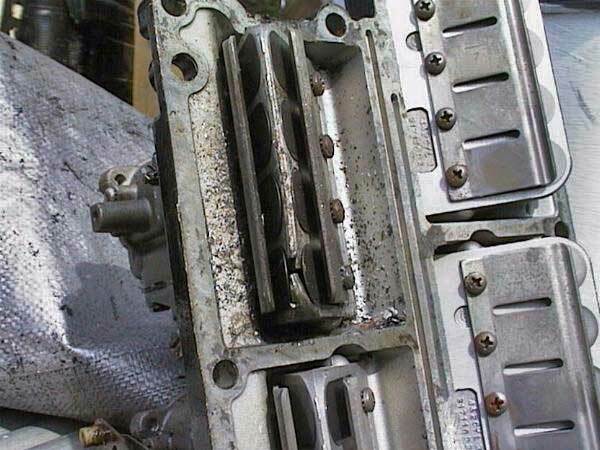 These problems are caused by the lowering of octane, removal of lubricating lead and detergents from the fuel, not by engine design. These are just a few examples of what can happen to your equipment without proper care. A lot different than your car that cruises lazily down the freeway at 2500RPM. BE aware and diligently care for your outfit, it will return the favor with many years of trouble-free service.